TPU received word from Scythe that the Japanese cooling firm will show off its Katana 4 processor cooler at CeBIT 2012. Additionally, Scythe will also reveal new audio solutions. Japanese cooling expert Scythe is going to show brand new products at the famous CeBIT trade show in Hannover (Germany) from 6th until 10th March 2012. Scythe booth will be located in the planet reseller hall 15 at the booth number F44, which is organized in a cooperation with its partner Wave Computersysteme GmbH. Interested visitors will be able to discover brand new Scythe products. 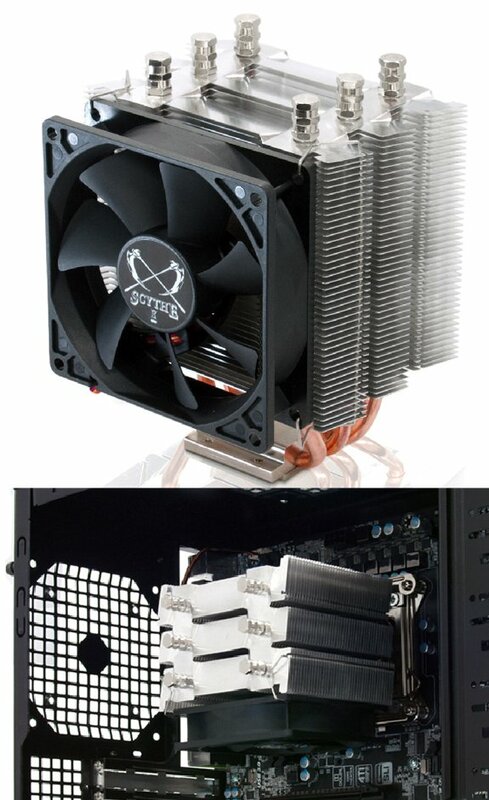 Soon to be release Katana 4 CPU Cooler is providing a first outlook into future Scythe product designs. Katana 4 is Scythes this year's exhibition highlight, introducing the innovative fin structure design called A.T.F.S. (Aero Tuning Fin Structure). A.T.F.S. tilted structure utilizes the intake holes for additional precise airflow, maximizing the Katana 4 CPU Cooler's efficiency. In addition, Katana 4 is equipped with the brand new mounting clip set by the name N.G.C.S. (New Generation Clip System). Hence allows the 480 grams cooler to be mounted on latest sockets, providing maximum socket compatibility. Furthermore, visitors will be able to experience Scythe's top seller products as well as two new digital amplifiers from Scythe audio product portfolio. In particular Scythe will exhibit the two newcomer amplifiers Kama Bay Amp Pro (SDAR-3000) and Kama Bay Amp Mini Pro (SDA35-2000). Both amps are class D amplifiers, which differ in size, design as well as specs. Double decker Kama Bay Amp Pro (SDAR-3000) is utilizing a powerful Toshiba TB2924AFG IC, providing 16 watts of continuous output per channel and a multitude of features. Compact Kama Bay Amp Mini Pro fits into a common 8,89 cm respectively 3,5 inch bay of a pc chassis. Built-in MAX98400A Power IC from MAXIM allows continuous output of 24 watts per channel. Despite the compact size, Kama Bay Amp Mini Pro is equipped with many features and offers even a Line-in and USB Power connector in the front.